Don’t be scared of something new, save time and knock off work early! Change can be a scary thing. We all have our own way of doing things and changing the way we do things in our workplace can be a terrifying prospect, especially when we are all so time poor. TUV would like to make the next improvement you make to your recruitment process, as pain free as possible. They are so confident that the online video interviewing tool will save you heaps of time and help you make better recruitment choices, that they let everyone try it first with no commitments what so ever. Then, once you decided you couldn’t live without this handy piece of tech genius, they continue to offer a pay as you go, no commitment package, alongside monthly subscriptions for larger clients. So go on, don’t be scared of trying something new. The online video interviewing tool allows you set your questions, and receive recorded interviews from each potential candidate answering your specific questions. You can share the interviews with other decision makers in the recruitment chain, even delegate the whole process and just wait for the interviews to roll onto your computer screen. Great for those of you that can’t give up entire days sitting down to do first round interviews. TUV are the only superyacht specific provider of video interviews and their system is highly secure, yet uses minimal bandwidth. Crew can record their interviews on their mobile phone, tablet or laptop anywhere in the world using a 3G signal or local WiFi, and don’t need to worry about poor signal strength effecting the interview. Plus because the interviews are pre-recorded, time zone challenges are also a thing of the past. You can set the questions when it is convenient, and the crew can record their interview in their own time. Having received overwhelming feedback from the Captains, senior crew, management companies and crew TUV urge you to try it out, save loads of time and knock off work early for once! FunAir’s new Yacht Golf partner Albus Golf makes marine friendly golf balls made from fish food. You may have seen them used in the recent Necker open by Richard Branson and his guests. 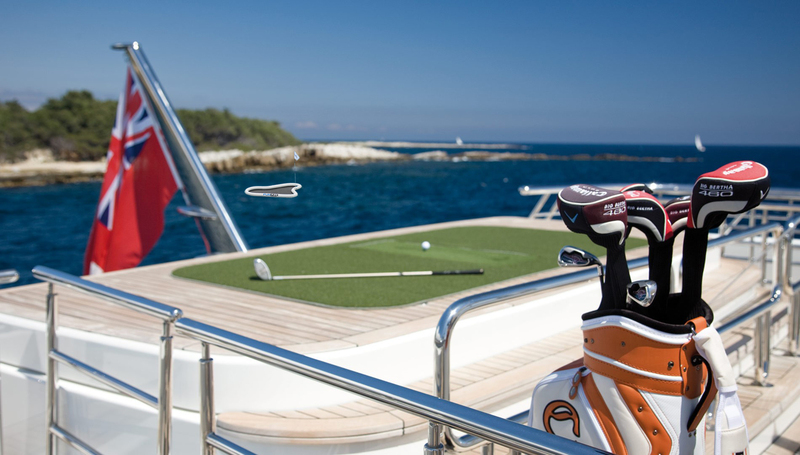 FunAir recently met with Albert Buscató, founder of Albus Golf and the two innovative companies soon realised the eco-friendly golf balls make the perfect partner for the FunAir Yacht Golf. Yacht Golf has already had an upgrade since its launch at the Monaco Yacht Show in September. The floating golf greens are now available in a range of shapes and sizes, some of which replicate famous greens from around the world. Each can be purchased individually or as a set of three, and still comes with a genuine golf pole and flag, along with a box of Albus Golf Ecobioballs so you can play out to sea, and try for that hole in one with a clear conscience. The clever Ecobioballs will completely dissolve into fish food within 2-6 days depending on conditions and can be purchased separately with the yacht logo printed on it. Both Yacht Golf and the Ecobioballs will be on display at Antigua Charter Yacht Show 2017. To find out more and meet with John Courtney, please email yachting@funair.com or call +1 512 751 4276.